Sr. Mary Caritas, Jackie Bolieau, and Sr. Joan Mullen say Mary’s Meadow — with its spacious community areas, gardens, and central chapel — was designed to look and feel as little like a nursing home as possible. Sr. Mary Caritas isn’t sure which feature of Mary’s Meadow its residents and patients like best, but there’s plenty to choose from. Specifically, the nursing home, carved into a former open meadow beside Providence Place in West Springfield, is built on a small-home concept, with four houses connected by a chapel, said Caritas, vice president of the Sisters of Providence Health System. Each of those houses features 10 rooms that, in turn, open onto a spacious common area and a kitchen. In other words, it doesn’t feel like a nursing home. Gone is the nursing station central to a traditional skilled-nursing facility, replaced by medication and supply cabinets in each room; nurses visit each room to administer care. Also jettisoned are long corridors, extensive off-limits areas, and a central bureaucracy calling the shots for all patients. Mary’s Meadow residents have full access to their house’s kitchen, outdoor garden, and other space, and individual house councils make decisions on menus, activities, and routines. Instead of strictly regimented staff, the ‘elder assistant’ who works in a house is a CNA who provides direct care, laundry, cooking, and housekeeping. Since its opening last summer, Mary’s Meadow — now completely occupied — has brought plenty of excitement to the Sisters of Providence campus, Caritas said. But it started with a promise. 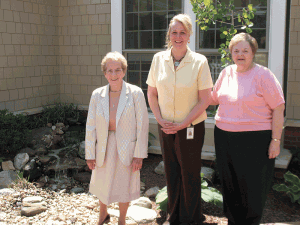 Mary’s Meadow was established partly to keep a promise to provide a home for sisters who were moved from Providence Place when it became an independent-living facility; they were temporarily housed on one floor of Providence Behavioral Health Hospital. The new facility’s name derives from the fact that all Sisters of Providence once took the name Mary. And it’s appropriate that this facility, created to welcome the sisters home, is also helping patients return to their own homes. The small houses are designed for both long-term living and short-term rehabilitation, and the staff believes the homelike model is conducive to recovery. Scientific evidence seems to back up that assertion, Caritas said, pointing to a study published in the Journal of the American Geriatrics Society suggesting that residents of small nursing homes are more satisfied with their care and report a better quality of life than residents of larger, traditional nursing homes. The report cited higher quality-of-life measurements, such as meaningful activity and relationships; comfort and a sense of security; dignity, individuality, and privacy; and the enjoyment of food, according to one of the researchers, Rosalie Kane, a professor with the University of Minnesota’s School of Public Health in Minneapolis. The study specifically examined the model featured at Mary’s Meadow: an interconnected community of four 10-resident homes. The survey suggested that such residents have a lower incidence of later decline in activities of daily living when compared with 40 randomly selected residents in each of two traditional nursing homes. The researchers also found that quality of care in the small-house dwellings at least equaled that provided in the traditional nursing homes and that residents showed significantly higher satisfaction with the small-house nursing home as a place to live, and were as socially active as residents of traditional nursing-home residents. Additionally, aides working in the small-house model “were much more confident that they could help their residents achieve better social and psychological outcomes, felt they knew the residents under their care better, and had much higher job satisfaction on a variety of measures and were more likely to remain in the job,” Kane told Reuters Health. Writing in Long-Term Living magazine, Judith Rabig and Donald Rabig go so far as to suggest that the traditional model of care is an outdated relic. “Traditional nursing-home staff have been organized in a 19th-century industrial model, with a steep bureaucracy, departmental structures, and disenfranchised direct-care workers receiving top-down communication,” they write. “Staff is viewed as interchangeable, and their satisfaction is secondary to efficiency and completed work quotas and schedules. Staff work is focused on satisfying residents’ physical and safety needs, with no time or institutional imperative directed at meeting their higher-level needs. Yet, despite the evidence that the small-home concept works, they write, implementation of a different model is no easy task. Sr. Joan Mullen, president of the development project, said the concept has been difficult for even regulators to grasp. “We had to get quite a few construction waivers” — 56 of them, to be accurate, she said. For instance, the corridors in a nursing home must be a certain width, but the rooms at Mary’s Meadow don’t open onto corridors at all, so Mary’s Meadow installed beams in the ceiling to mark where corridors would have gone. Plenty of thought — and some very long meetings — have gone into the design and features of Mary’s Meadow, from computer access, electronic medical records, and a wireless call system to strategic uses of color. For example, the carpeting of each home is a different shade, and that color is reflected in the stained glass that borders each chapel door that leads to a different home, reducing the possibility of a resident losing his or he way. Meanwhile, from the layout of the private bathrooms to the meals — eaten at a long dining table, as a family would, with opportunities for residents to help with preparation and cleanup — everything has been designed to make Mary’s Meadow look and feel nothing like a nursing home. And that’s the point. “This is based on patient and staff empowerment,” Mullen said. And, as Caritas noted, the residents and short-term patients feel like they’re home — no matter what name they go by.